The Democrats can use all the assets they can find as they approach a midterm election that grows increasingly challenging. The polls are daunting. The electoral map for both the Senate and House is unfavorable. And history is rarely kind to the president’s party in midterm voting. But the Democrats have two significant assets in the form of Barack Obama and Bill Clinton, the president and former president who have thrown themselves into the 2014 campaign with gusto. In a real sense, the pair — the only two-term Democratic presidents since World War II — offer complementary strengths. Although his presidential approval rating is mired in the 40%-to-45% range, Obama is still an effective fundraiser for the Democrats. And from his “bully pulpit” in the White House, he is positioned to help frame issues such as the minimum wage, income inequality and immigration reform that could assist his party’s candidates. Clinton, meanwhile, is not only able to articulate the stakes in competing policy visions. But he is also an effective on-the-ground campaigner who resonates well in many parts of the country that will not give Obama a hearing. Both candidates reflect their past. Clinton is a son of the rural South. He was born in the small town of Hope, AR, a place that has been a part of Clinton’s political persona since he burst onto the national stage in 1992. Obama’s life has been molded in urban America. Although he was raised in Hawaii, his adult years have been spent in Chicago (and Washington). As vote-getters, both men have reflected their roots. In winning the White House twice, they both ran well in the Democrats’ geographic base on the two coasts — the Northeast and the Pacific West — as well as the battleground states of the industrial Midwest. 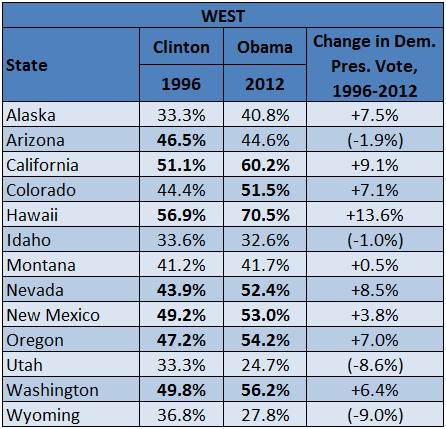 Obama, though, generally won a higher share of the vote than Clinton in states with a large metropolitan population, such as California, Florida and Ohio. And he took Indiana and North Carolina in 2008, as well as Virginia in both 2008 and 2012 — all states that Clinton never carried. Yet from West Virginia to Missouri, Clinton was able to win a number of rural-oriented states in the South and border South where Obama was defeated in both 2008 and 2012, in many cases by landslide margins. Clinton’s two presidential victories were more geographically sweeping than Obama’s, as he took 32 states in 1992 and 31 in 1996. In his two successful presidential races, Obama won 28 and 26 states, respectively. The disparity was even more striking when taken to the congressional district and county levels. When Clinton was reelected in 1996, he won nearly half (more than 1,500) of the nation’s 3,100 or so counties and nearly two-thirds (280) of its 435 congressional districts. When Obama was reelected in 2012, he carried less than a quarter of the counties (barely 700) and less than half (209) of the congressional districts. Yet Obama was comfortably reelected because he won where it counted. Of the 39 counties with a 2010 population in excess of 1 million, Obama carried 35. Only two Democratic presidents have been reelected since World War II, Bill Clinton in 1996 and Barack Obama in 2012. When comparing the prowess of the two as vote-getters, each had their advantages. 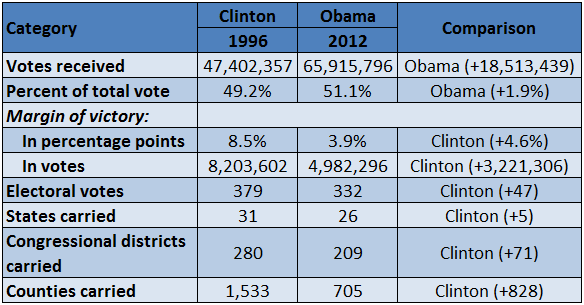 Obama was reelected with far more votes than Clinton 16 years earlier and drew a higher share of the total vote. But Clinton was involved in a three-way race of sorts, as third-party candidates led by Ross Perot took 10% of the vote. As a result, Clinton actually scored a wider victory in 1996 than Obama two years ago in terms of margin of victory (in both votes and percentage points); electoral votes; states won; and congressional districts and counties carried. Note: The total of counties carried includes similar jurisdictions such as independent cities. Sources: America Votes 30 (CQ Press/SAGE Publications). The number of counties carried by each candidate was compiled by the author using appropriate editions of America Votes. The number of congressional districts carried was compiled by Polidata. The separate pulling power of the nation’s two most prominent Democrats has already been on display in Kentucky, where Clinton made his first campaign foray of 2014 in February on behalf of the Democratic Senate candidate, Alison Lundergan Grimes. She is challenging Senate Minority Leader Mitch McConnell (R) in a contest that has drawn considerable national attention. Clinton turned out to be a good draw. He carried the Bluegrass State twice for president, the last Democratic nominee to do so; Obama lost it twice by margins in excess of 15 percentage points. During her appearance with the former president, Grimes lauded the Clinton presidency for creating prosperity, but according to news reports, did not mention Obama once. Apparently, that is fine with the White House. Clinton is better positioned to help Democratic candidates in states such as Kentucky, Arkansas, Louisiana and West Virginia than Obama is. Yet as the year unfolds, Obama could probably be of assistance to embattled Democrats in states and districts where there is a large minority or youth vote, elements of the electorate in which Obama has run particularly well. In Charlottesville, for instance, the home of the University of Virginia (as well as the Crystal Ball), Clinton never drew more than 62% of the vote in his two presidential bids, while Obama never won less than 75%. Both Democrats have experienced the damage that can be done to the president’s party in a midterm election. In Clinton’s first midterm in 1994, Democrats lost both the House and the Senate and never regained either chamber during his presidency. In Obama’s first midterm in 2010, Democrats lost the House, making his ability to govern difficult. And the Democrats are again playing defense this year — trying to hold the Senate with little chance of regaining the House. Clinton, at least, was able to enjoy the leavening impact of a favorable midterm election in 1998, when the president’s party bucked the historical trend to actually gain seats in the House. An improved economy and the widespread perception of Republican overreach in pushing Clinton’s impeachment played major roles in the outcome. Obama has not experienced such a midterm comeback, nor do many expect him to in 2014. Instead, he has taken on the role of a Cassandra of sorts, urging Democrats to turn out in larger than anticipated numbers this fall or experience the dire consequences that he predicts would come from a robust Republican Party in control of Capitol Hill. Both Bill Clinton in 1996 and Barack Obama in 2012 scored clear-cut reelection victories, but with coalitions that were sculpted a bit differently. Clinton ran better than Obama among white and older voters, when comparing exit polls from each year. 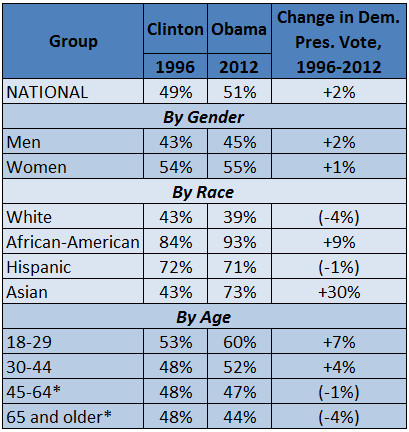 Obama polled a perceptibly higher vote share than Clinton among younger voters, African Americans and Asians. Both candidates ran similarly well among Hispanics. Note: Exit polling for 1996 broke down the ages of older voters as 45-59 and 60 and older. Sources: Exit poll data for 1996 is from a multi-election table published in the New York Times on Nov. 5, 2008. Exit poll data for 2012 is from the New York Times’ web site. As shown in Map 1 below, both Bill Clinton in 1996 and Barack Obama in 2012 followed similar, but not identical, paths to reelection. Each dominated on both coasts — the Northeast and the Pacific West — as well as in the battleground states of the industrial Midwest. 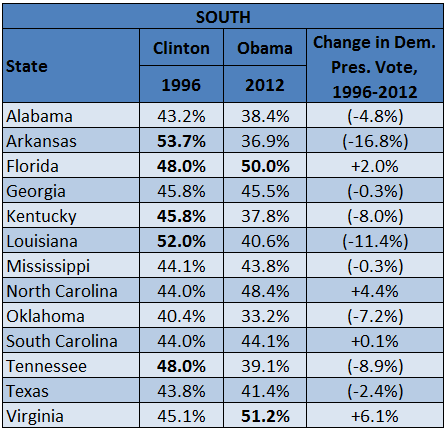 Clinton, though, demonstrated much more appeal than Obama in rural America, winning a number of states in the South and border South that Obama did not come close to carrying. 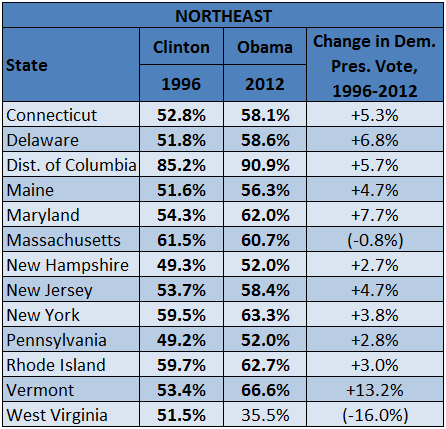 On the other hand, Obama’s prime strength was in states with large metropolitan populations, where he tended to win a higher percentage of the vote in 2012 than Clinton did in 1996. Obama won two states in 2012 that Clinton did not in 1996, Colorado and Virginia, although Clinton did take the former in 1992. 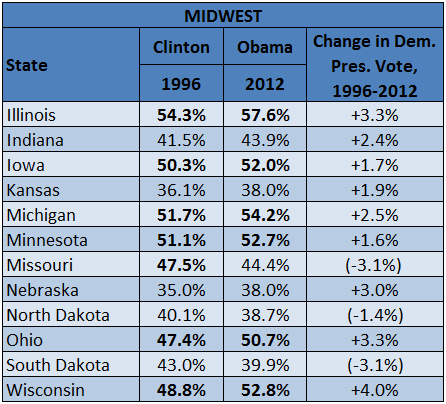 In the tables below, vote percentages in states won by Clinton (1996) and Obama (2012) are indicated in bold type. Note: There are two basic ways to compute candidate vote percentages in a presidential election. One way is to use the total vote cast for all candidates, of which Clinton drew 49.2% in 1996 and Obama 51.1% in 2012. A second way is to use only the major-party vote, which bases the percentages on just the Democratic and Republican vote and ignores those cast for others. Clinton took 54.7% of the major-party vote in 1996; Obama received 52.0% of the two-party tally in 2012. The decided difference in the Clinton vote from one measurement to the other is due to the nature of the 1996 election, which included a significant third-party option in the form of Ross Perot, the Reform Party entry that year. In this chart, however, percentages are based on the total vote, since that is most commonly used in the political world. For the record, Clinton carried Colorado, Georgia and Montana in 1992, but not 1996. 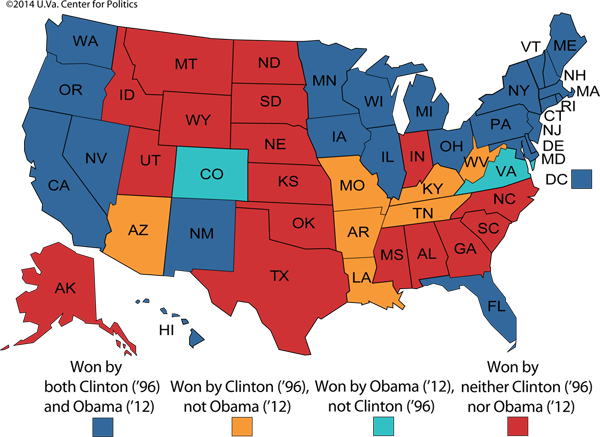 Obama won Indiana and North Carolina in 2008, but not 2012. For a PDF version of these tables, click here. Source: America Votes 30 (CQ Press/SAGE Publications).